We knew that something like this was coming but now we have confirmation. The Galaxy S8 has dethroned two flagship devices from their respective number one positions in the AnTuTu Benchmark test rankings. With a score of 205284, the S8 has officially dethroned both the OnePlus 3T (162423) as the number one Android handset on the list and the iPhone 7 Plus (181807) as the number one handset across all platforms. Check out the video here and see it happen live. If you are wondering which chip the S8 in question is using, we are not entirely sure. It could be the Snapdragon 835 or the Exynos 8895, but whichever one it is, we doubt the results will differ by much on either. 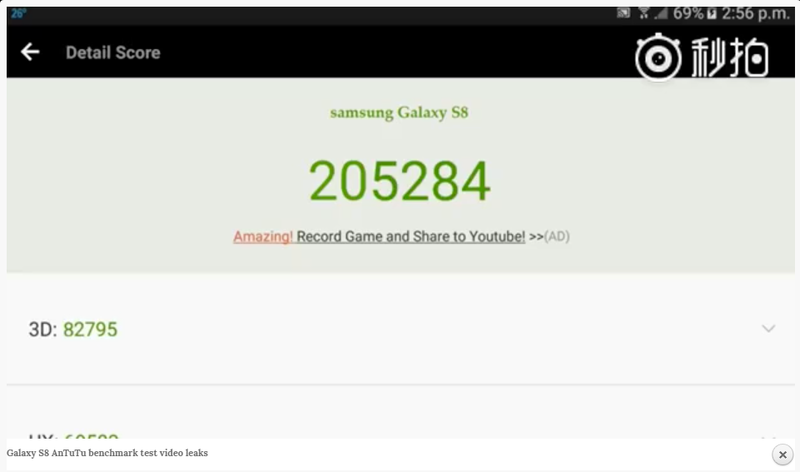 What we can tell you is that this is the Galaxy S8 that is being tested in the video, as made evident by the SM-G950 model number and the "Galaxy S8" confirmation given by AnTuTu at the end of the video. Now that we have a new king of benchmarks among us, would you be buying it when it comes out in April?